Screechers Wild is the latest collectables - they are transformers type cars, racers, that transform and battle. With the blaster, you shoot the disc directly at your Screecher and it transforms into crime-fighting creature mode. You use the launcher to launch the Screecher onto the nearby disc, the spring-loaded vehicle drives into it and it goes into the front slot where it stays captured and enables the morph from vehicle to creature. The landing is not only thrilling but stable as well. 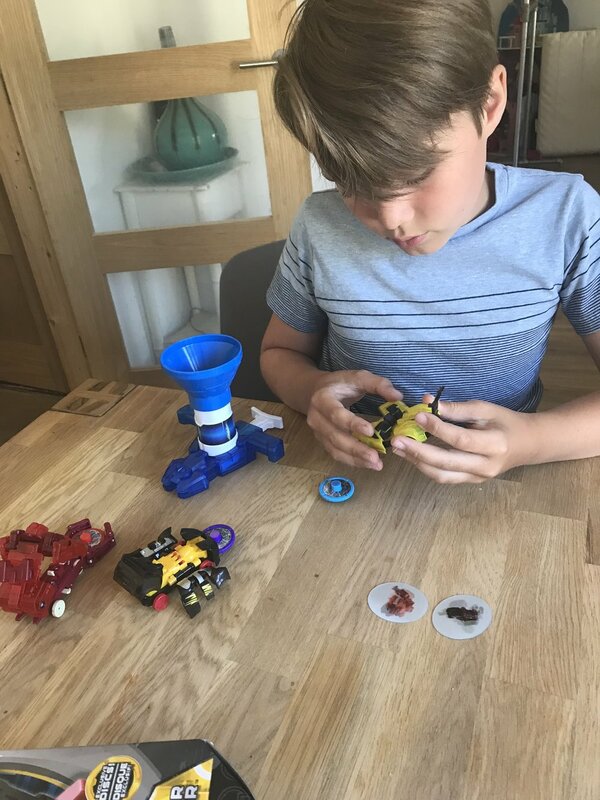 For this review received the Rapid Fire Disc Blaster, Screecher Speed Launcher sets, as well as individual Screechers Wild packs: Monkey Wrench and NightWeaver. All come with discs - which are collectable too. There's a total of 12 Screechers to collect. With the Rapid Fire Disc Blaster, you shoot the discs at your Screechers and they instantly 360 flip and morph. And, with the Screecher Speed Launcher, where you can aim and launch your Screecher onto a disc. With your Screechers they are grouped into three levels: Level 1, Level 2, and Level 3 vehicles, and each one includes collectable discs and they are interchangeable; any disc can be used in any vehicle. The magnetized disc captures really well, they are very reactive. We love how it catches the discs! Jacob really enjoys flipping them and the set is really robust and works really well. He's shot them countless times and they continue to work, so that allows the set to be more enjoyable for him. He's played with his Screechers Wild for hours, his favourite Screecher being Nightweaver and he has Nitebite on his Wishlist to buy. Screechers Wild are great as they are fun and easy to play. Don't forget to watch the YouTube episodes.